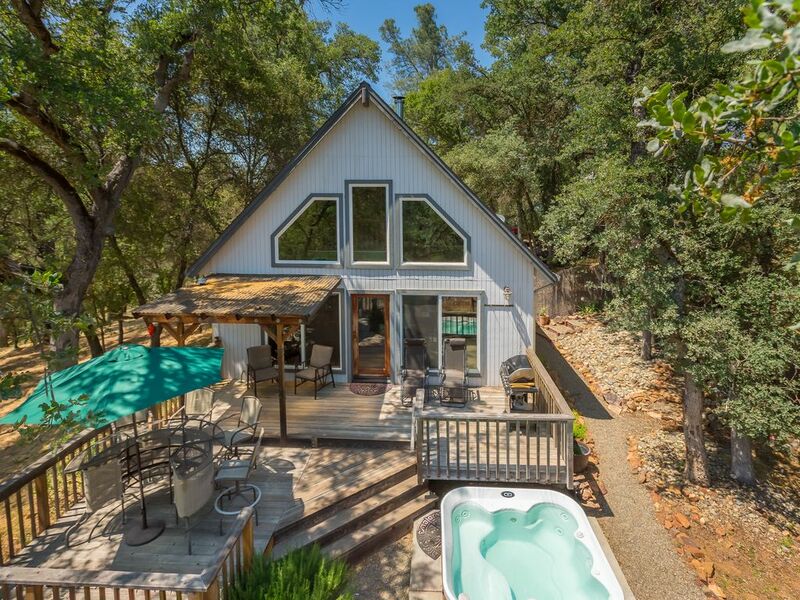 Cute Cottage Close To Yosemite With Great Views, WiFi And Hot Tub. This charming private cottage with beautiful views of the mountains is a great get away for a couple or small family. You'll enjoy the private "country" setting and the proximity to the several Gold rush towns of Mariposa area. Just over an hour, through our "Wild and Scenic" Merced River Canyon, is Yosemite National Park. This cottage has a 1 bedroom with a full loft, which looks out through the large 2 story windows to the mountains. There is a fully stocked kitchen with all modern appliances. During the cold months, you can enjoy a nice glass of wine or hot cup of chocolate snuggled up to the wood burning stove. The wood for the stove is always fully stocked. It is close to the Badger Pass winter sports area and ice skating in the park and Tenaya Lodge. We offer his and hers snowshoes and snow sleds for a fun day in the snow. The bedroom and loft are appointed with comfortable queen beds and a sofa that turns into a very comfortable double bed (There are reviews verifying the comfort of the bed.). The towels and linens are high quality soft cotton. The loft has a comfortable sitting area to read and relax. The library provides a wide variety of books, games and puzzles. From the living area you can walk out onto the private deck with seating for 6+, a gas grill and a hot tub. The hot tub is right off the deck, which you can relax and soak up the incredible view of the sierras or star gaze in the evening. All year we provide a herb garden and in the summer we grow yummy tomatoes for the guests to enjoy. We also have a beautiful home on the same property, which is private and separate from the cottage. The home can be rented with the cottage for a big get together. To view the home please see 769053. Living so close to Yosemite we wanted to share such a beautiful and peaceful place with others and so we purchase this charming cottage. We have traveled all over the US, Mexico and Europe and feel fortunate to call Mariposa our home. This is a perfect secluded location just minutes from downtown Mariposa and a short drive into Yosemite Park through Scenic Merced River Canyon. You can sit and lounge on the deck and enjoy the views and wildlife. Sit in the hot tub at night after a day of hiking in the park and enjoy the stars. During the winter time, you can snuggle on the couch and enjoy a fire in the wood stove. Plenty of plush towels available for the guests. This full kitchen offers all dishware, cookware, glassware and serving accessories. Books for both adult and children to enjoy. Lots of board games, cards and puzzles. Incredible views of the mountains from the deck! The Hot Tub is maintained and running year round. This cottage is on the same property as a larger 3 bedroom vacation rental, which has a private pool, spa and game room with beautiful views. This place was just perfect. Overlooking a valley, tucked in the hills around Mariposa we had the perfect place for a getaway. The loft bedroom was our choice and the bed and pillows were perfect. For a couple or small family this is perfect for that alone time. We really enjoyed our stay here . This place is beautiful, clean and has everything you need . Hot tub was perfect after long and tiring day of hiking . It’s 1 hour 20 mins away from Yosemite valley . Thank you for our hosts for such a pleasnant experience. The place was a perfect dip into nature, a beautiful clean house and even came with wild turkeys gobbling around the neighborhood. Highly recommended! Very enjoyable stay! Will be back! Great, private cabin with amazing views. Relaxing. This cottage has everything you thought you didnt need! It's sooooo cozy, the view is amazing, and it was so great to have the place to ourselves! It wasnt too far away from Yosemite and the grocery store was near too! It was super clean. I wish i could give it 10 stars! Susan was so quick to answer her phone when i had questions! 10/10 would come back and definitely recommend! Rate are subject to change until confirmed booking.